1Centro de Investigaciones Biológicas del Noroeste, La Paz, Baja California Sur, 23096, México. 2Facultad de Ciencias Agrícolas, Campus Xalapa, Universidad Veracruzana, Xalapa, Veracruz, 91090, México. *Corresponding author: rchiquito@uv.mx. 3Centro de Investigación y Asistencia en Tecnología y Diseño del Estado de Jalisco, Guadalajara, Jalisco, 44270, México. The objective of this study was to determine the efficiency of applying microcapsules and liquid inoculation of three Pseudomonas putida strains on growth and yield of tomato plants in greenhouse where the results showed differences between both treatments. Rhizobacterial strainsFA-8, FA-56, and FA-60 of P. putida, were assessed individually and combined to determine their capacity to produce indoleacetic acid (IAA). The three strains demonstrated the capacity to produce IAAin vitro, of which FA-56 stood out with 23.02 µg mL-1 in the microcapsule treatment with significant increases in plant height, stem diameter, radical volume, dry biomass, fruit yield, and rhizobacterial population (CFU). These responses could have been associated to the intrinsic capacity of this strain to produce a greater amount of IAA, hormone related to promoting plant growth. The use of plant growth-promoting rhizobacteria (PGPR) as biofertilizers by means of microcapsules could be an alternative in agricultural management and sustainable production of tomato. Immobilization of P. putidarhizobacteria by alginate microcapsules confers protection and gradual release, improving adhesion, permanency, and colonization of cells on the roots, promoting a better effect as PGPR and productivity in tomato plants. The use of microorganisms as biofertilizers in cultivation production has been a common practice in the last years. Plant growth-promoting rhizobacteria (PGPR) (Kloepper, 1993) has stood out as biofertilizer because these microorganisms adapt and grow rapidly around plant roots (Ahirwar et al., 2015; Ul Hassan and Bano, 2015). Moreover, PGPR induce growth directly or indirectly by producing regulators, such as gibberellins, cytokinins and auxins, fixation of atmospheric nitrogen, insoluble phosphorous solubilization (Lugtenberg and Kamilova, 2009; Belimov et al., 2015), siderophore production (carboxylates, hydroxamates, phenol catechol, and pyroverdines) (Solanki et al., 2014; Barea, 2015), antibiotics, extracellular anti-fungal metabolites, such as proteases, glucanases, chitinases, salicylic acid, cyanide (Bakker et al., 2013; Kamou et al., 2015), and systemic resistance mechanisms of the host (Bakker et al., 2013). The genera of PGPR that mostly stand out are Pseudomonas, Azospirillum, Azotobacter, Enterobacter, Bacillus, Rhizobium, among others (Berg, 2009; Barea, 2015; Kamou et al., 2015), which can be inoculated in plant, seed, root, or soil (Shen et al., 2013; Bashan et al., 2014). Plant response to PGPR inoculation varies considerably depending on rhizobacterial species, host, soil type, inoculum density, environmental conditions, and inoculation method (Berg, 2009; Shah et al., 2017). The method of incorporating PGPR has an influence on the establishment and permanency of bacterial populations in the rhizosphere and indirectly on its growth promoter effects (Sivakumar et al., 2014; He et al., 2016). Within its inoculation forms in plants, those that stand out are microcapsules, which have demonstrated to be more efficient than liquid inoculation because they mainly provide protection to bacterial cells allowing them to survive longer in the plant rhizosphere (Bashan et al., 2014; Schoebitz and Belchí, 2016). Nonetheless, inconsistencies have been found in the results that have been reported because some studies have mentioned that plant increase in seed germination, plant growth, biomass, and yield were not significantly differently when PGPR were inoculated in microcapsule or in liquid forms in plant roots (Sivakumar et al., 2014; Schoebitz and Belchí, 2016). For this reason, it was necessary to evaluate the effects of different inoculation techniques of each rhizobacterial strain to find the most efficient method for promoting plant growth and yield (Atieno et al., 2012; He et al., 2016). Thus, the objective of this study was to determine the efficiency of applying microcapsules and liquid inoculation of three Pseudomonas putida strains on growth and yield of tomato plants in a greenhouse experiment. The experiment was conducted in a 160-m2 tunnel-type greenhouse located in the Faculty of Agricultural Sciences Campus Xalapa, Universidad Veracruzana, Xalapa, Veracruz, Mexico at latitude 19° 30, N, 96° 55, W and altitude 1450 m.
Strains of P. putida were provided by the Laboratory of Agricultural Chemistry of the Faculty of Agricultural Sciences, Campus Xalapa, Universidad Veracruzana catalogued as FA-8 (NCBI GenBank database sequence with accession number KT223583); FA-56 (NCBI GenBank database sequence with accession number KT223581); and FA-60 (NCBI GenBank database sequence with accession number KT223582). Rhizobacteria were grown in B-King (glycerol 10 ml L-1, peptone 15 g L-1, magnesium sulfate 1.0 M [1 ml L-1] and dibasic potassium phosphate 1.5 g L-1) liquid medium at 28 ± 2 °C and 160 rpm for 48 h. The concentration of each rhizobacterial strain was adjusted to 109 cells ml-1 with a spectrophotometer at a wavelength of 660 nm and absorbance of 1. Rhizobacteria were grown in 20 ml of B-King liquid medium supplemented with 0.5 g L-1 of L-tryptophan and incubated at 28 ± 2 °C and 160 rpm for 72 h. Rhizobacterial cultures were centrifuged at 5000 rpm for 15 min and one ml of the supernatant was mixed in two ml of Salkowski’s reagent (FeCl3 12 g L-1 in H2SO4 7.9 M), letting it stand at room temperature and complete darkness for 30 min (Glickmann and Dessaux 1995). The indoleacetic acid (IAA) of each sample was quantified with a spectrophotometer at a wavelength of 530 nm. The production of IAA of each rhizobacterial strain was determined by a standard curve of 0, 5, 10, 15, 20, 25, 30, 35, 40 µg ml-1 of pure IAA, considering B-King medium without inoculating as control. Three replicates per treatment were performed, and the experiment was conducted twice. Seeds of Monica (SAKATA® Seed Corporation, Yokohama, Japon) hybrid saladette tomato were used. For seedling production, a 200-cavity polystyrene germination tray was used, previously disinfected with 3% sodium hypochlorite solution for 5 min and washed-rinsed with sterile distilled water. The germination tray was filled with a mixture based on vermicompost, pumice, and sand (2:1:1 v/v), which was sterilized with a sanitizing and disinfecting liquid solution of Anibac 580® (Promotora Técnica Industrial, S.A. de C.V., México, e.g. quaternary ammonium [1st. generation] at 8.6% and quaternary ammonium [double chain] at 3.7%) in doses of 5 ml L-1. One seed per cavity was placed in the germination tray and maintained in greenhouse at 26 ± 5 °C and 60 ± 5% RH for 30 days. Method 1: To produce sodium alginate microcapsules, 100 ml of each rhizobacterial concentration were taken and mixed with 2.2 g of sodium alginate and shaken at 350 rpm for 20 min. A 5-ml transparent polyethylene Pasteur pipette was used to take the rhizobacterial mixture of sodium alginate forming drops placed in a sterile solution of 0.1 M CaCl2 at 0.1 M. The solution was shaken at 100 rpm for 30 min; microcapsules were withdrawn and washed three times with sterile saline solution of NaCl at 0.85% (w/v). A batch of microcapsules (MIXmc) was made with the mixture of the three rhizobacteria. Microcapsules of approximately four mm in diameter were preserved in a sterile solution of 0.1 M CaCl2 at room temperature for 24 h until their inoculation in plants. Method 2: At transplanting, the root of each plant was inoculated with 5 ml of each rhizobacterial strain grown in B-King liquid medium (concentration 109 cells ml-1). A batch of seedlings named MIXlm was inoculated at the same time with the mixture of the three rhizobacteria strains. Previous to transplanting, seedling roots were washed; subsequently, 50 microcapsules (mc) of sodium alginate of each rhizobacterial were applied to a group of seedlings, and 5 ml of liquid medium (lm) of each rhizobacterial strain were applied to another group. For both inoculation methods, a group of seedlings was inoculated with the combination of the three rhizobacterial strains named MIX. A randomized block design was used with nine treatments: FA-8mc, FA-56mc, FA-60mc, MIXmc, FA-8lm, FA-56lm, FA-60lm, MIXlm, and control (plants without rhizobacterial). The plants were maintained in greenhouse in 8-kg black polyethylene bags containing as substrate 6 kg of pumice previously disinfected with liquid solution of Anibac 580® (in doses of 5 ml L-1) for 120 days. During the experiment, an average temperature of 26 ± 5°C and 60 ± 5% RH was recorded. All plants in all treatments were fertilized with a nutritional solution (g L-1) composed of Ca(NO3)2∙4H2O (1.43), Mg(NO3)2 (0.95), KNO3 (0.38), KH2PO4 (0.35) and micronutrients TRADECORP®AZ (Madrid, España) Fe, Zn, Mg, B, Cu, and Mo (0.03). At the end of the experiment, height, stem diameter, radical volume, root length, fresh and dry biomass, fruit yield, total soluble solids (°Brix) in ripe fruit juice, and colony forming units (CFU) were quantified. Eight replicates were performed per treatment, and the experiment was conducted twice. Determinations of CFU were made at the end of the experiment (120 days after inoculation). One sample of 3-g fresh root was collected from the inoculated plants with each rhizobacterial strain and the non-inoculated control. The samples were placed in Petri dishes with sterile saline solution of NaCl at 0.85% (w/v). Subsequently, following the methodology proposed by Holguin and Bashan (1996), samples were macerated with a sterile glass rod, and serial dilutions were performed by triplicate per treatment for plate counting with solid B-King culture medium. After incubation at 28 ± 2 °C for 72 h, the population of each rhizobacterial strain was determined and expressed as CFU 108 g-1 (Gamalero et al., 2002). The experiment was conducted twice. The laboratory experiments (IAA and CFU) were conducted in a completely randomized design, and the greenhouse experiment was established with randomized block design. The data obtained in the experiments were processed by the analysis of variance (ANOVA) and Duncan,s multiple range test (P < 0.05) with the statistical program SAS version 9.4 for Windows. The production of IAA of the three P. putida rhizobacteria showed significant differences (P < 0.05) with variations from 13.92 to 23.02 µg mL-1 (Figure 1). The metabolic activity of strain FA-56 stood out producing the greatest concentration of auxin, which influenced an increase in growth promotion and yield of tomato plants (Table 1). Figure 1. Bacterial indoleacetic acid (IAA) produced in vitro by strains FA-8, FA-56, FA-60 of Pseudomonas putida and control (B-King liquid medium without inoculation). Each value of data represents the average of three replicates. Different letters show significant differences under Duncan’s multiple range test (P ˂ 0.05). Table 1. Effect of microcapsules and liquid medium bacterial of three rhizobacteria strains of Pseudomonas putida on growth and productivity of tomato plants in greenhouse. †MIX = mixture of three rhizobacterial strains of P. putida. Average values (n = 8) within the same column with different letters denote significant differences in the assay with randomized block design and Duncan,s multiple range test (P < 0.05). The plants inoculated with microcapsules or liquid bacterial culture of the three rhizobacteria showed significant differences (P < 0.05) on morphological parameter and productivity of tomato (Table 1). The plants inoculated with microcapsules of the strain FA-56 increased height, stem diameter, radical volume, dry biomass, and fruit yield in 13%, 31%, 22%, 45%, and 20%, respectively. The MIXmc treatment increased 34% root length, and the MIXlm treatment increased 72% fresh biomass. For the variables, radical volume and total soluble solids (°Brix) did not show statistically significant differences among the treatments. 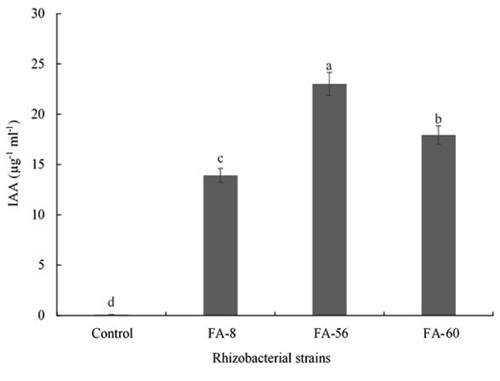 The presence of the rhizobacterial population (CFU) quantified in the rhizosphere of the plants inoculated with microcapsules and liquid bacterial culture with P. putida strains showed significant differences (P < 0.05) among treatments (Figure 2). 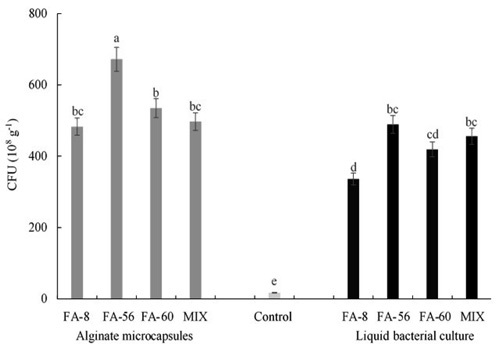 With the microcapsules, a greater CFU was maintained for all the rhizobacteria (CFU 108 g-1 of roots), of which the population obtained from the strain FA-56 stood out. A low population of bacteria was observed in the control treatment. Figure 2. Colony forming units (CFU) quantified in "Monica" hybrid tomato plant roots, inoculated with microcapsules and liquid medium bacterial of Pseudomona putida strains FA-8, FA-56, FA-60, MIX (mixture of three strains) and control (plants without rhizobacteria) at 120 days after transplanted to greenhouse. Each value of data represents the average of three replicates. Different letters show significant differences under Duncan’s multiple range test (P ˂ 0.05). The production of IAA has been widely studied as plant growth-promoting mechanism by rhizobacteria, stimulating cell division and tissue, differentiation directly expressed in biomass increase (Viscardi et al., 2016; Nadeem et al., 2016) besides intervening in enzymatic activities as ACC deaminase related with ethylene levels and reducing sugar during fruit maturation (Belimov et al., 2015; Gamalero and Glick, 2015). Determining IAA in rhizobacteria as a growth-promoting mechanism and an increase in cultivation productivity is important within the species selection process, such as P. fluorescens and P. putida (Ahirwar et al., 2015; Shah et al., 2017). Inoculating microcapsules of rhizobacteria on plants increased growth and yield of tomato because this type of inoculation improves the effect of PGPR, acting as mini-reactors that confer stability, protection, population increase, and a gradual liberation of bacterial cells in the plant rhizosphere environment(Sivakumar et al., 2014; Schoebitz and Belchí, 2016). Different authors have mentioned a greater effect in applying rhizobacteria based on microcapsules compared with its liquid application, increasing diverse morphological parameters and productivity in tomato(Pastor et al., 2016), corn (Hungria et al., 2010) and potato (Arseneault et al., 2015), among others. The stimulating activity of plant growth by rhizobacteria as P. putida is due to its capacity of synthesizing growth regulators, such as auxins, gibberellins, cytokinins, and vitamins; antagonistic metabolites as siderophores and hydrocyanic acid (HCN), as well as for their ability to facilitate nutrients through phosphorus solubilization, biological fixation of atmospheric nitrogen, and ion chelation (Vacheron et al., 2013; Bashan et al., 2014; Ul Hassan and Bano, 2015). The highest content of total soluble solids (°Brix) in fruits of the three treatments (FA-60mc, FA-56lm and MIXlm) was likely due to metabolism of rhizobacteria that stimulated plant growth and essential nutrient assimilation. It induced ethylene production (Gamalero and Glick, 2015), which promoted enzyme synthesis reducing sugar in the fruit cell wall and generating simple sugar that increased total soluble solids (°Brix) in fruit during the maturity process (Ordookhani and Zare, 2011; Vázquez-Ovando et al., 2012). Although the three strains assessed as growth promoters were from the same P. putida species, the fact that strain FA-56 stood out in most of the morphological parameters and fruit yield of tomato. This result could have been due to a more efficient metabolic activity of the strain since its capacity to synthesize IAA was greater than the other strains (FA-8 and FA-60). This growth regulator produced by rhizobacteria has been closely related to its direct effect for promoting plant growth, as it has been reported in some studies (Joshi and Joshi, 2017; Nadeem et al., 2016). To influence plant growth rapidly and directly, rhizobacteria express chemotactic mechanisms, related to the presence of chemoreceptors and genetically codified systems. These factors determine the ability of rhizobacteria to colonize the rhizosphere rapidly and efficiently establishing communication with root cells, which cause rhizobacterial movement to the plant rhizoplane initiating a mutually beneficial relationship (Berg, 2009; Mwita et al., 2016; Israr et al., 2016). Combining the three P. putida, rhizobacteria did not have a synergic effect among them, which is why plant growth promotion was less than when it was individually induced by the FA-56 strain in microcapsules although the three strains showed the capacity to synthesize IAA. Studies have shown that the incapacity of several microorganisms to act jointly as effective inoculants in plant growth promotion is related to the root colonization process since bacterial cells grow and distribute through the rhizosphere depending on soil humidity, pH, temperature, microbial antagonism, space competence, radical exudates, as well as the physiological state in which the bacterium introduces itself and the likely specificity of the host. Facing these factors, only those cells capable of proliferating rapidly and invading the roots in a large number will achieve promoting plant growth effectively (Gupta et al., 2015; Pathak et al., 2017).The population rate of bacterial cells in plant rhizosphere depends essentially on the inoculation method applied and in the organic compounds produced by the radial exudates, of which aminoacids, organic acids, phenols, phytohormones (auxins, gibberellins, and cytokinins), sugar, vitamins, and enzymes stand out (Berg, 2009; Bashan et al., 2014; Barea, 2015). The quantity and quality of plant radical exudates promote competence for these metabolites in rhizobacteria, as well as by the site they occupy on the plant root; thus, the unions between the epidermic cells and the area where the root emerges are the sites with greater attraction, adhesion, activity, and microbial population (Raaijmakers et al., 2009; Vacheron et al., 2013). With respect to the low bacterial population density observed in the control treatment where the plants were not inoculated with P. putida rhizobacterial strains, it could have been due to the presence of bacteria or yeast coming from contaminated sources, such as irrigation water, plant management during pruning, pest and disease control, and harvest, among others. Nonetheless, such population did not affect plant growth in control. Finally, immobilization of bacterial cells by microcapsules offers greater protection and viability time, facilitating a gradual release of rhizobacteria and causing a greater effect on growth and productivity in plants(Bashan et al., 2014; He et al., 2016; Schoebitz and Belchí, 2016). Further work is necessary to perform assays in field to determine the potential of applying alginate microcapsules with P. putida as biofertilizer on promoting growth and productivity of tomato plants. Moreover, supplementary studies should be performed to determine their antagonic capacity toward phytopathogens, production of other hormones, such as gibberellins and cytokinins, nitrogen fixation, phosphorous solubilization, enzymatic activity (glucanases and chytinases), cyanhydric acid production, and siderophore synthesis. The use of PGPR as biofertilizers through alginate microcapsules can be a viable alternative in agronomic management of tomato plants and sustainable agricultural production. The authors are thankful for financial and technical support provided by the Faculty of Agricultural Sciences Campus Xalapa, Universidad Veracruzana and D. Fischer for translation and editorial services.